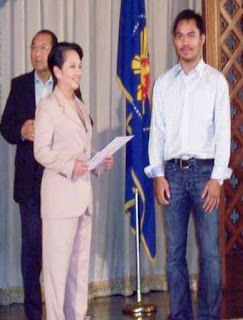 PGMA (President Gloria Macapagal Arroyo) has appointed Manny Pacquiao to be the Special Envoy of the President for the Games in the 2008 Olympics this August and the country’s flag-bearer. WOW! That would really be an honor for the Pacman. Executive Secretary Eduardo Ermita said that as ambassador, Pacquiao would be carrying the national flag at the Beijing Olympic’s opening ceremony which will be attended by Arroyo herself upon the invitation of Chinese President Hu Jintao. "Can you imagine, the one that will hold the flag ... is a Filipino world champion? Of course, Ambassador Pacquiao, imagine that, pinakyaw nya na lahat” he said. The 29-year-old Manny Pacquiao, widely considered the best "pound for pound" boxer in the world having won his fourth world title in a fourth weight class, destroyed Diaz of the United States in nine rounds to take the World Boxing Council (WBC) lightweight title in Las Vegas on June 29. WOOhhoooo!